I was so greedy trying everything that they called me “golosa” – which means I love to pig out (on FOOD)! Colombian food is simple, straightforward, filing, and comforting. Most dishes are geared mostly for energy content and quantity for the physically hardworking people. Most dishes feature a lot of carbs, high fats, and balanced with protein. Bandeja paisa is classic example of this. The affordable “corrientazo” meals feature this also (a fast lunch set). 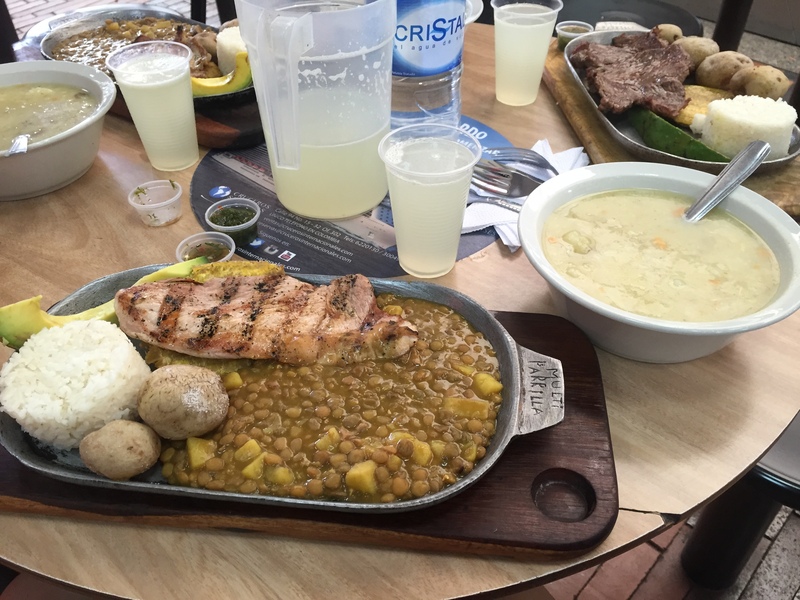 Our corrientazo set came with a rice soup (caldo), one grilled meat, rice, lentils, potatoes, avocadoes, plantains, and lemonade – all for a mere USD3.50. I find Colombian food simple and tasty. And the use of coconut milk, panela, and rice (commonly featured in Indonesian food) means I would never crave Asian food there. Colombian food at times means family and sharing. 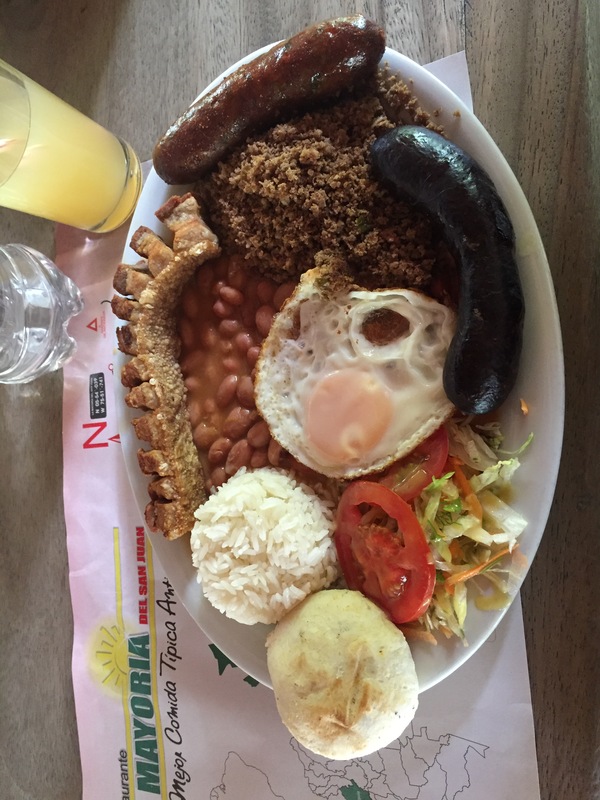 In Sutamarchan’s La Fogata who is famous for its spicy sausage (longaniza), families order “bandeja” (platter). 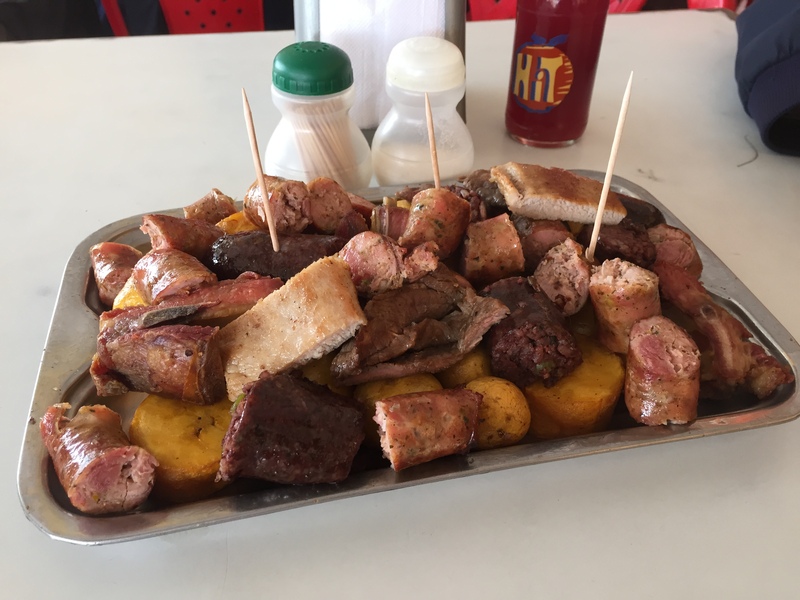 Our platter consisted of longaniza, murcilla (blood sausage), grilled beef, grilled pork, and small potatoes (potatoes criolla). 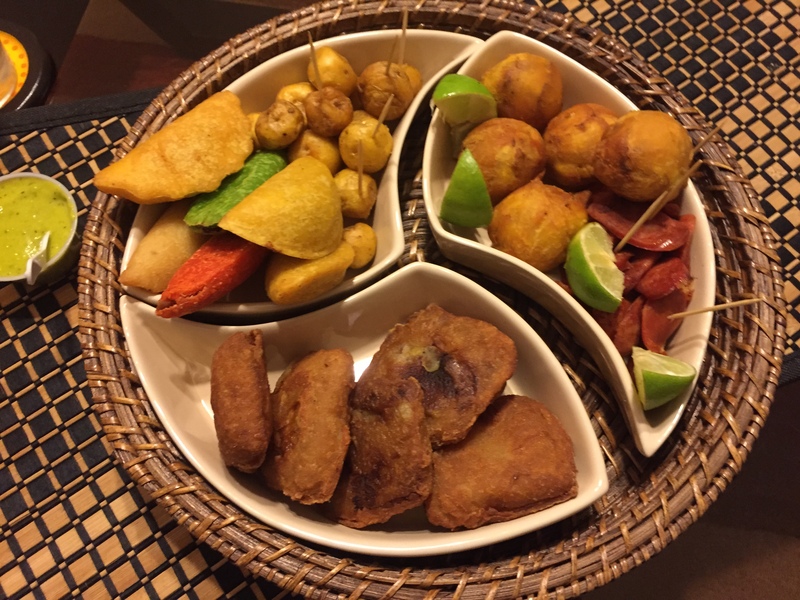 Vegetables are mostly absent in most Colombian typical food. I do not consider plantains, corn, lentils, beans, and potatoes as vegetables! We often see parsley, tomato, and onion (all used to make “hogao”). Otherwise, other leafy vegetables are mostly absent. I am also amazed of what they can do with bananas and plantains. In Popayan we really enjoyed a plantain baked with cheese and topped with chicharron (crispy roasted pork skin). And no meal is complete unless I have a tasty fried patacones on the side. Nothing beats Colombian hospitality. A friend in Cali invited us to her place and bought us a bunch of street snacks that are typical of Cali. We tried marranitas, empanadas, aborrajados, chorizo, and bofe. Marranitas are a ball of plantains with crunchy or ground chicharron inside. Empanadas are savoury pastries that come with different filings: chicken, beef, cheese, etc. Aborrajados are deep-friend plantains with cheese. Chorizos are sausages. Bofe are cow’s lungs (usually served grilled). Her mom also made us rice pudding with milk. Amazing! Desserts are very sweet and features many coconuts and dulce de leche (arequipes) and local fruits. 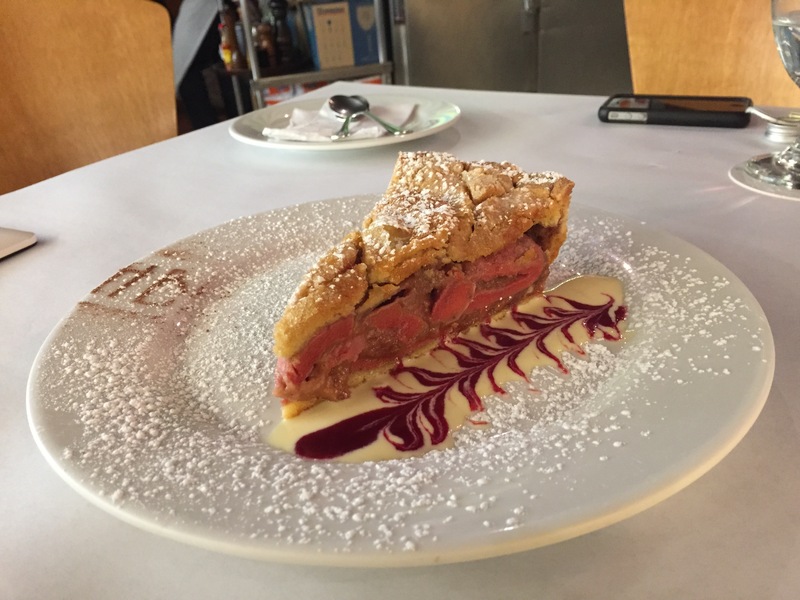 We tried pie de guayaba (guava) from Harry Sasson Bakery in Bogota. It was amazing and not too sweet. We tried milhojas de arequipe (layers of pastries with arequipe – similar to French mille-feuille) at Marea in Cartagena. We tried pie de coco and coconut symphony tart from Mila Vargas in Cartagena. All was amazing. We also had fun trying ice creams with local fruit flavors. A trip to Yogen Fruz had me trying yogurt flavored with lulo and feijoa (both local fruits). Blackberries (mora) are widely consumed in Colombia. Drinks feature many local fruits, lime, or coconuts. I am addicted to mint lemonade (limonada de hierbabuena) and coconut lemonade (limonada de coco). Colombia is also blessed with unique tropical fruits. Granilla is a favorite of mine (it is similar to passionfruit but it is very sweet). Uchuva is similar to gooseberry has also become a favorite of mine. 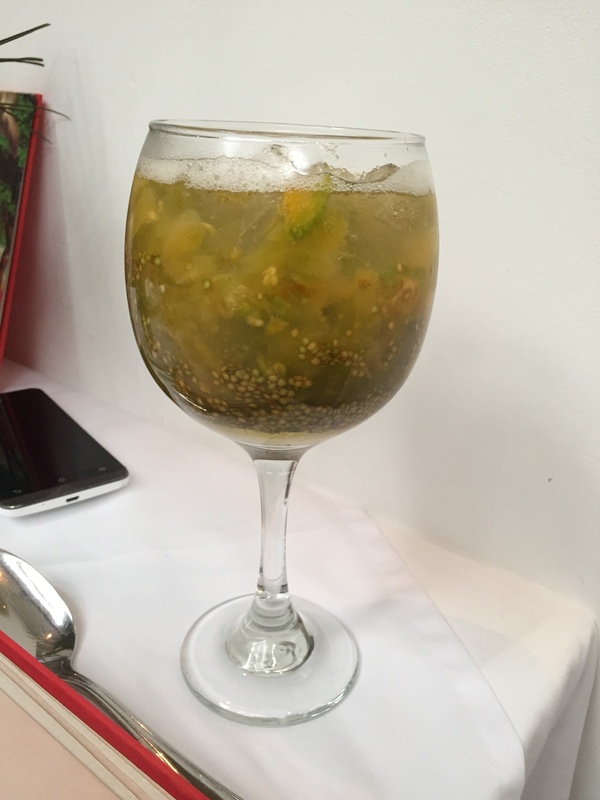 In Platillo Voladores in Cali, we tried a refreshing non-alcoholic fruit cocktail called Lulada. Coffee and chocolates from Colombia are also specials. Most places would feature Santanderian chocolates. We made a trip to Juan Valdez (local Starbucks) every day. I usually drink Cafe Tinto (black coffee and no sugar). I ended up buying coffee beans from Huila and Antioquia regions. 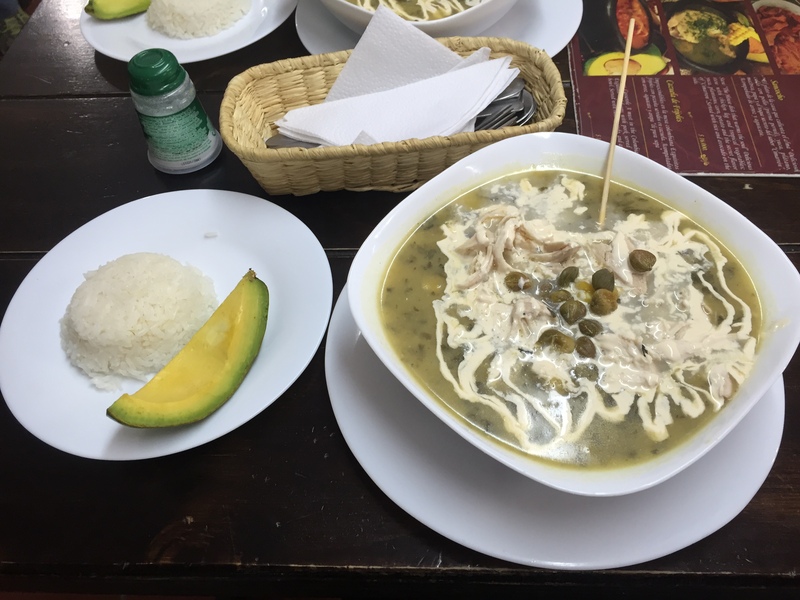 When it comes to Colombian dishes, each region has their regional specialities, and we tried to try those dishes only in their respective regions. Sometimes we are successful, sometimes we are not, but most of the time it was tasty anyway. We also did not manage to try some items we wanted, such as sancocho de gallina (soup from hen, not chicken) from Cali, caldo de costillas (pork rib soup), and cuchuco de trigo con espinazo de cerdo (corn and pork soup). A tripe soup from Antioquia. We tried it at Mondongo’s restaurant. It was so tasty. I had additional broth. 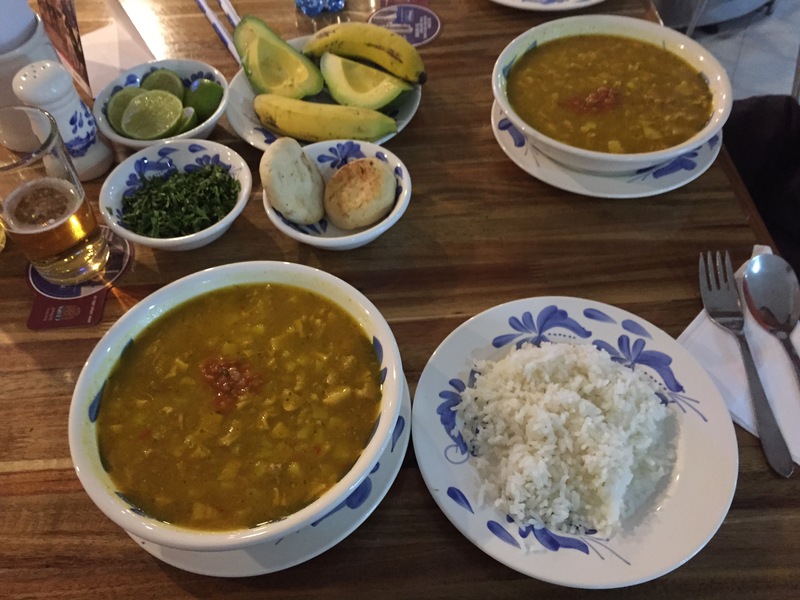 The soup is served with rice, banana, and avocado on the side. Garnishes of lime, cilantro (parsley), and ají are optional. On a quick note, white rice in Colombia is very tasty. They seem to cook their rice in butter or oil of some kind. This is different from Asia where white rice is cooked only in water without other seasonings. This is perhaps the most famous of all Colombian dishes. Each restaurant and abuelitas (grandmothers) would have their own versions, but generally it contains chicharron (fried or roasted or smoked pork belly), frijoles (beans), rice, fried plantains (patacones), sausage, murcilla, arepa, and ground meat. Each dish is sufficient for a normal person’s daily intakes! It was simple and not sophisticated. Its purpose is for a physically hardworking person’s meal. I enjoyed it. We had it twice 🙂 Once in Hato Viejo in Medellin, and another time near Jerico in Antioquia. Known as sweating arepa. 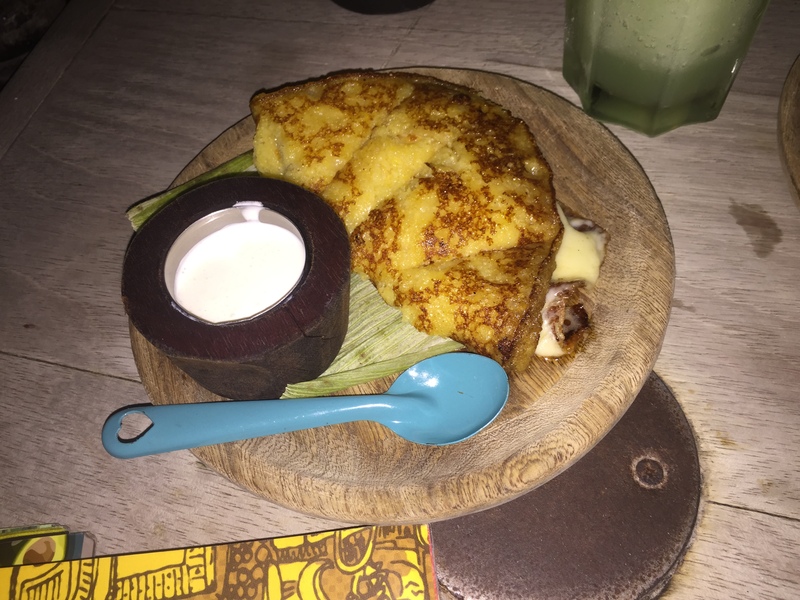 It is grilled arepas with fresh cheese in between. One can choose arepas from corn, flour, or cereals (mix of linseeds and quinoa). Yum! It is sweet and savory at the same time. The corn is the best. It was more smooth. The other two came out drier. Tinjaca is a small town in between Bogota and Villa de Leyva. 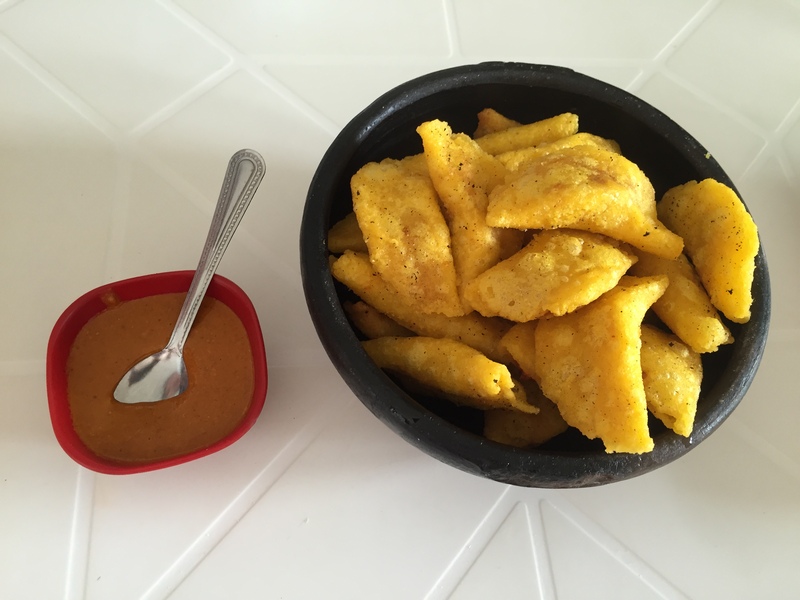 A must try in Cartagena. It is commonly eaten in the North / Mar Caribe area (I had it in Tayrona on a beach). 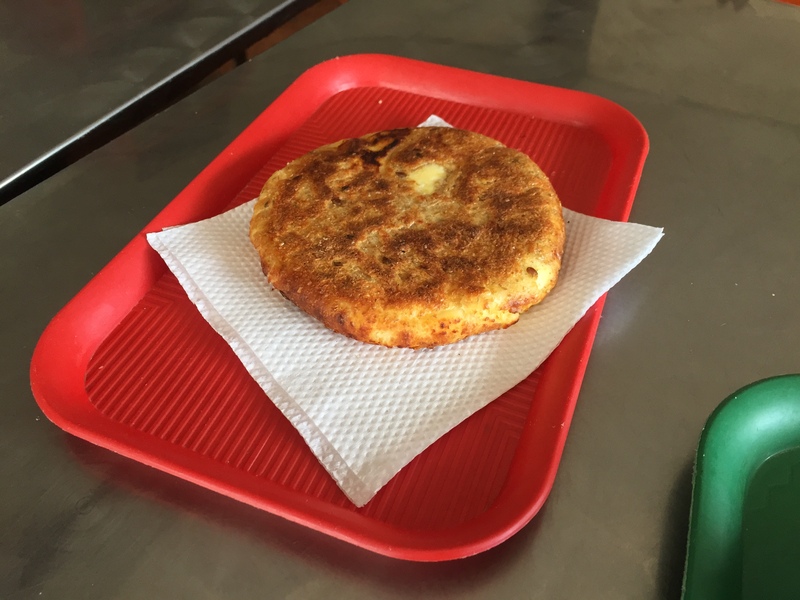 It is made from egg that is put inside the arepa and then fried. You can also put other toppings apart from the eggs. It can be a heavy snack or a meal of its own. We had this at Andres Carne de Res. the only amazing thing we ordered from this overrated restaurant. It is arepa from sweet corn. We chose to have it with melted cheese. It is served with suero (sour cream). Mini empanadas with pumpkin seeds filings. They are served with spicy peanut sauce. 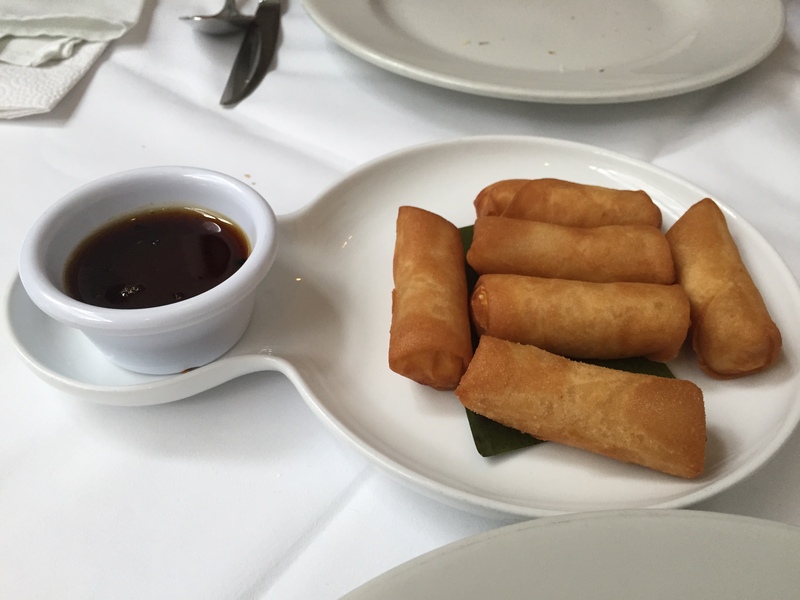 It reminds me on Indonesian peanut sauce we usually consume with our fried pastels or fried spring rolls. We had them at La Fresa Cafeteria in Popayan. We came back twice. Doña Emerita is the Queen of Empanadas de Pipian! Hands down! We had this at La Cevecheria in Cartagena. It is rice that is fried with panela (brown sugar from sugar cane) and coconut milk with seafood. The dish is called Mulata Tropical Paella at the restaurant. So yummy and filing. It is like eating Indonesian fried rice (sweet and savoury). 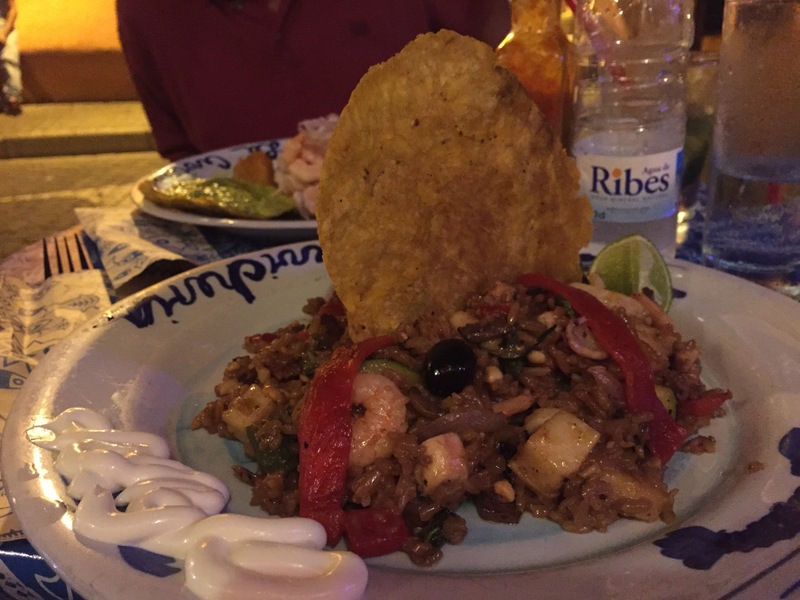 We had a few ceviches (including those at the popular La Cevecheria and La Perla in Cartagena) on our trip, and we have had ceviches when we went to Peru and/or Peruvian restaurants. The best ceviche is at Platillo Voladores in Cali! There is a good balance of sweet and sour in the leche. It is to die for. It is even better than Gaston Acurio’s La Mar Cebecheria in San Francisco, although I have yet to try his restaurant in Lima. 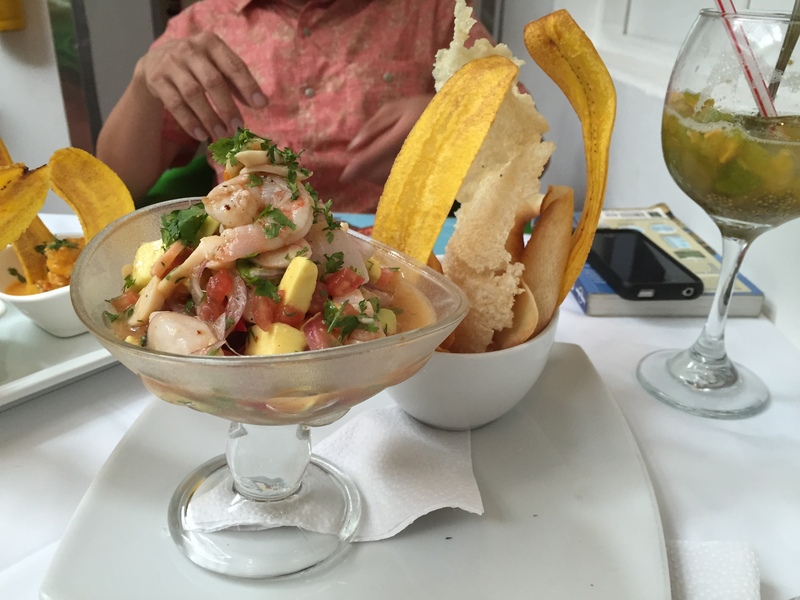 Ceviche at Platillo Voladores, Cali – Best Ever! Voladores took this fruit as a filing of a fried roll and serves it with a sweet sauce. It really changed the flavor of the fruit, and the result is phenomenal. Our culinary trip to Colombia has been fun and satisfying. My waistline is a testament to that. Thank goodness for spandex and anything stretchable.